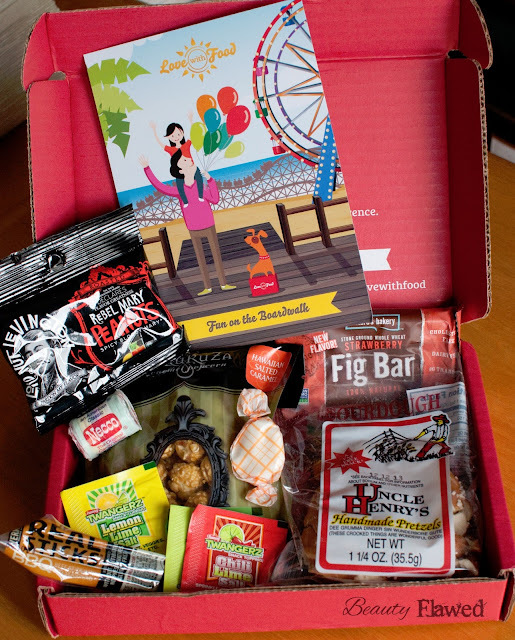 I've had my Love with Food box for July for a few days now and I've already managed to try everything in the box. Now I did eat a few of the things in full others I just tried a bit or two of I think this was an okay month but don't really think the theme "Fun on the Boardwalk" was hit upon all that well. Don't get me wrong some of the items were definitely boardwalk themed but others just left me with a big question mark as to how they would relate to the boardwalk. Everything was interesting though so lets head on and see just what was in this box. I don't really know why they call this "Hawaiian" Salted Caramel Popcorn, for me it's taste does not bring on any Hawaiian feeling. This was not one of the products in the box that I liked it had a very salty tang to it and bitter or almost burnt aftertaste. Not a good combination in my opinion. This was good the flavor was very authentic and the texture was soft. The only thing I didn't like about this was how chewy it became after chewing it for a bit. Spicy things are so not my thing and after about three of these peanuts I was done with them. They are spicy that's for sure. My boyfriend liked them well enough though the flavoring was a bit cakey and stuck to my fingers quite a bit other than that they were tasty if you like spice. These were delicious not too sweet and had a soft chewy texture. They melted in my mouth and were soft enough that I didn't feel like I would loose a filling when eating them. These I haven't actually had a chance to try out yet. The concept reminds me of the Mexican candy I used to get when I lived in Michigan though. I'm sure they will be interesting to try at least. Mine was quite smashed up upon arrival which is fine it still eats all the same just not as pretty. This pretzel was incredibly salty I didn't even finish the whole thing and I actually started chipping off the salt pieces on the few parts I did eat. It was okay but not something I would buy again. This is one of the products I'm skeptical about when it comes to the theme of this box. How does a fig bar relate to the boardwalk? Well never mind that because this is quite delicious, I enjoyed it the most out of everything in the box. I think we all have had these a time or two I don't' really like the wafers as they usually end up tasty chalky. I tried one of these just to be sure and yep they still taste chalky. So there we have it the Love With Food box for July, again I did like this box but I thought last month they did a better job. Love With Food is $10 monthly + $2 shipping for 8+ gourmet food items delivered to you're door. Use Code TTFRIEND for $5 off your first order! Good job and keep it up with P90x! I wish I have the same discipline as you. It's so hard! I'll be on a good streak for a few weeks and then that motivation is diminished. It's like a roller coaster for me. Smh. I wish you didn't mention the dessert sub... Now I'm going to google it! =D hehe! Have a great evening hun! I got this box too for my first month and wasn't that impressed. My Pretzel was smashed too and I agree with it being way way too salty, I couldn't even eat it.. The popcorn I had didn't taste bitter but it was definitely too salty. My peanuts I felt weren't spicy. I felt like they were definitely missing that spice the only taste I got from them was vinegar. That's all I could taste :( I was actually disappointed with it. I wonder what they were thinking when they added THAT much salt to the pretzel I'm sure we weren't the only ones who thought it was too salty. Maybe I got a bad batch or something because it was just off in some way and so not "Hawaiian" imo. Aww that's no good I'm really sensitive to spices so that could be why it was so much hotter for me. I've always been such a sissy when it comes to hot food lol. Look like great moving going snacks.